We’ve heard it said before that in the land of the blind the one-eyed man is king. But what happens when in the land of 20-20 vision the one-eyed man is still king? Phoenix Suns basketball star Steve Nash answered that question in a recent playoff game. Late in the game he took an elbow to his right eye and sustained serious damage, albeit temporary. The gash required six stitches. Nash returned in the fourth quarter and scored ten points to help seal a 107-101 victory in the deciding game of the playoff series against San Antonio. A video produced by Sports Illustrated provides a whimsical and semi-scientific analysis of how remarkable Nash’s one-eyed performance was. We have two eyes not only so that we are a little more attractive than a Cyclops, but also to give us the power of depth perception. Consider how important depth perception is in shooting a basketball through a hoop or hitting a curve ball (a near-impossible task under the best of circumstances). When we examine important political or social issues, we always try to get the best perspective on the problems. But “best perspectives” by some lead us to invade Iraq for no particular reason or to pass tax cuts for the wealthy that turned budget surpluses into deficits. “Best perspectives” can lead us to believe that an off-shore oil rig is safe, when it’s an accident waiting to happen. Nash’s performance reminds us that there are times when we’re handicapped and don’t have the best perspective, but we can still excel. Perseverance can be as important as perspective, and awareness of our shortcomings can overcome the arrogance of certainty. We’ve heard it said before that in the land of the blind the one-eyed man is king.But what happens when in the land of 20-20 vision the one-eyed man is still king? 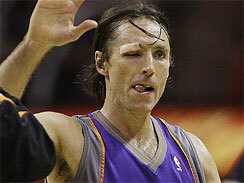 Phoenix Suns basketball star Steve Nash answered that question in a recent playoff game.Late in the game he took an elbow to his right eye and sustained serious damage, albeit temporary.The gash required six stitches.Nash returned in the fourth quarter and scored ten points to help seal a 107-101 victory in the deciding game of the playoff series against San Antonio. We have two eyes not only so that we are a little more attractive than a Cyclops, but also to give us the power of depth perception.Consider how important depth perception is in shooting a basketball through a hoop or hitting a curve ball (a near-impossible task under the best of circumstances). When we examine important political or social issues, we always try to get the best perspective on the problems.But “best perspectives” by some lead us to invade Iraq for no particular reason or to pass tax cuts for the wealthy that turned budget surpluses into deficits.“Best perspectives” can lead us to believe that an off-shore oil rig is safe when it’s an accident waiting to happen. Nash’s performance reminds us that there are times when we’re handicapped and don’t have the best perspective but we can still excel.Perseverance can be as important as perspective and awareness of our shortcomings can overcome the arrogance of certainty. Next Post:Hire and hire. Fed revamps process for job-seekers.